Marconi Sailing Club are looking forward to welcoming you all to our club for the a round of the Harkers Yard Rowing Race series on Sunday 7th January 2018. Here is some essential information about the day and what you can expect. Our OOD will wear a Hi Viz vest and be ready to welcome you be in the area of our main Flagstaff or the Hard/Sea Wall gates. We will have a Launch Marshall to co-ordinate launching order and trailers etc. A separate team will be on hand to operate the electric winch with more dressed to help the wet end of launching. Responsibility for launching will remain with the Gig Team’s own crew. Cars are not allowed on to the hard unless directed by the OOD or Launch Marshall. – please park as directed, and wheel your trailer or launch trolley, where you will be assisted down to the water by lowering on a winch. Please be aware of very slippery conditions caused by Ice if cold, and seaweed, plus trip hazards of blocks, wires, and winch ropes. Changing facilities with toilets and showers on site, room to leave bags and coats etc. there too for easy access through the day. Our sewage system is “Off Mains”, powered by our own pumps. Please only flush human waste down toilets (to avoid blockage and associated unpleasant tasks). We will arrange suitable places to moor Gigs, if necessary RIBs can take boats or crews to/from these designated moorings. We will highlight our facilities, risks and local conditions to all here. 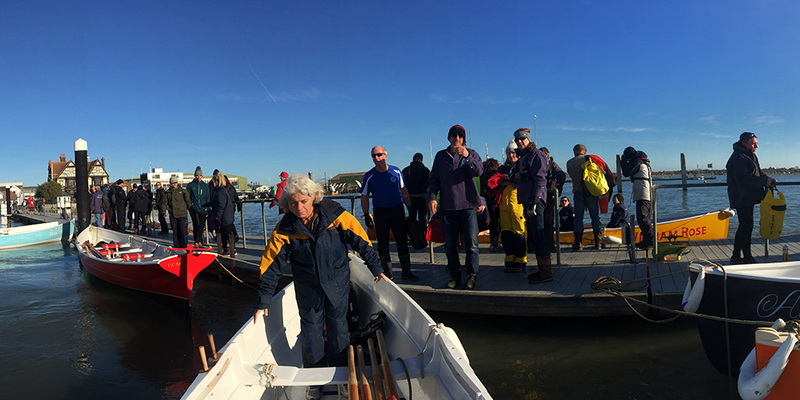 10.45 Launching commences from (note; below half tide). The bar will be open from approx. 12.00 (until it goes quiet! ), it is located below the galley. – this will be drawn after prizegiving. When Registering / signing on the team captain or responsible person will assess capability of coxswains and crew for the prevailing conditions and course, and is responsible for briefing his cox’ns and their crews accordingly. It is the responsibility of each individual to decide whether he/she should race, that they understand all rules and weather conditions, and retire or withdraw if unhappy. Please radio check to “Marconi Race Office” on VHF Channel M2/P4 before casting off to race. An exciting Massed Start race course will be set on the day, and will be dependent upon conditions – we are aiming for approx. 1 ½ miles, and to be in view from the clubhouse & sea wall, most of the time, coming close by to finish. Timing will be 5-4-1-GO, for info – the sequence of the hooter is pre-set. Any queries, please feel free to contact me for help. I look forward to welcoming you on the 7th.